Sinister Visions News and Updates: Midwest Haunters Convention Show Discount - Available to EVERYBODY! Midwest Haunters Convention Show Discount - Available to EVERYBODY! 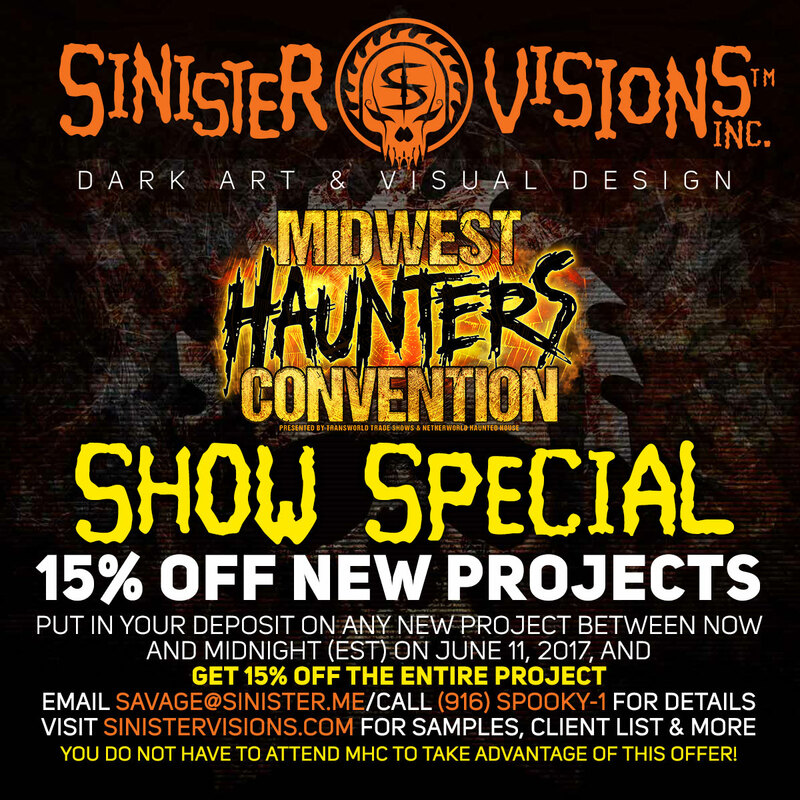 To celebrate the last big haunt show of the year before everybody buckles down to get their attractions ready for the Halloween season, Sinister Visions is offering a Midwest Haunters Convention Show Discount of 15% OFF to ANYBODY that books their project and puts in their deposit by midnight on June 11th (EST). To be clear, you DO NOT have to be attending the show to take advantage of this. Nor does your project have to be haunt-related (I'm looking at you, fellow vendors and escape room owners!). In fact, you don't even have to be 100% ready to move ahead with your project. All you have to do to get the discount is have your deposit in before the deadline and you'll get 15% OFF the entire project cost. If you're still getting your ducks in a row, we can wait to get started, but you'd still get the discount! So NOW is definitely the time to book Sinister Visions' services! Not sure? Have questions? Don't hesitate to contact Chad Savage at savage@sinister.me, (916) SPOOKY-1 or via the methods available HERE!